How to plan your dog car travel or dog airline travel, with you or unaccompanied, the more organized you are the easier it is. Dog car travel, is popular with most dachshunds and they are so good it’s easy to forget they are in the back seat. It's important to ensure that your dachshund is secure in the car, so if you have to brake suddenly they will be safe. Planning is the key to make traveling for your dog trouble free. If your dog is traveling with you or unattended take time to organize don’t leave it until the last minute. Ensure you dog is fit and well and his nails are clipped short, so he does not get them caught or cause any damage. Check health regulations for the relevant area, and pack all health certificates and vaccination records. Check your dog crate or carrier is in good condition and suitable for the trip. Pack some of your dog’s food, as you may find it difficult to purchase the same brand, also grooming gear, leash and collar complete with full identification tags. You need to ensure if the trip is more than 1 hour that you have water available and that you make toilet stops, and allow a short walk. Products that make traveling with your dachshund easier & safer. Harness Dog Car Safety Seat Belt system protects your dog in sudden stops and your dog is secure, comfortable and safe. A booster seat allows your dog to travel in safety and comfort.Raises a small dog so he/she can see out,doubles as a dog bed,while at your destination. Includes strap to secure your dogs harness to. Pet Car Seat Booster Carrier for Cats and Dogs up to 20-pounds which is extra strong, top and side entrances, folds down. When I say to our dog Jazz "we are going to the farm", she will get excited and go and wait by the car, as she loves spending time at my daughter’s small farm where she can run through the paddocks, and play with the children. In hot or warm weather never leave you dachshund in the car even if you have left the window down a little, as it is surprising how quickly the heat builds up and you beloved dog can die from hypothermia. Be aware of allowing your dachshund to jump in and out of the car it is better if you lift them in and out so they do not strain their back. 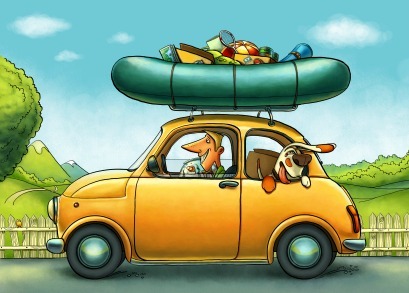 Although you may have organized your dog car travel successfully, don’t forget to check ahead for accommodation motels/inns etc that will allow pets to stay.